The SeceuroShield 38 extruded aluminium slat is a security shutter for higher security domestic use and medium security for commercial, retail and counter/cabinet applications. It is available as a built on or built in shutter. The shutter construction is basically the same for either with the difference being in the shutter roll cover and guides. For applications up to 4000mm wide when electrically operated it is a very versatile security shutter with a very strong construction and small and neat curtain roll diameter. The Seceuroshield 38 shutter is available as an internal swivel/geared belt driven manual operation, spring assisted manual push up/pull down or rod crank operation and electric operation with a large choice of access control devices such as keyswitches, pushbuttons, radio controls, etc. Extruded aluminium 60mm deep slat with reinforcing angle. Available with rubber in place of reinforcing angle as a no cost option. Die cast aluminium end plates with two piece roll formed aluminium casing. Larger sizes will be supplied with zinc plated steel end plates. Extruded aluminium with box section for fixing and reinforcement and high density 6mm pile brush seals. H30 guide profile as standard, H17 and H25 are available on request and H40/S is available at extra cost. H17 guide rail is suitable for internal use only. The Seceuroshield 38 is stocked in white (RAL9010), brown (RAL8014) and cream (RAL1015) but can be powdercoated to most RAL or BS colours at extra cost. The guides, bottom slat and box cover are stocked in white or brown as standard but again can be powdercoated. The Seceuroshield 3801 is a built on only version of the 38 which has been tested and approved for the LPCB certification. This is a 'secure by design' approved product and offers a level 1 rating for insurance purposes. The 3801 is an enhanced version of the 38 with extra strength in the bottom of the guides and additional requirments for fixing to enable certification. 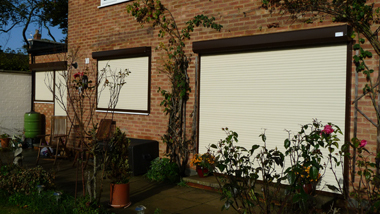 This shutter needs specialist installation and is offered by Samson with this service. Swivel/Geared Belt Shutters are raised and lowered from inside by a belt. Depending upon shutter size the belt is operated manually or by geared crank handle. This is a lower security option. Rod Crank Shutters are raised and lowered from inside by a geared rod crank winding handle which hangs down vertically underneath the box and secures on a clip when not in use. Electric Motors are required on larger shutters and are optional on smaller shutters. Tubular barrel motors fit inside the shutter axle and require a 3 amp fuse and 240V supply. Operation is usually by rocker switch, key switch or remote control as standard but othr controls are available. A manual override can be specified to operate from inside in the event of a power supply failure. Where desirable a manual override can also be engaged through the outside of an externally fitted shutter box. Under these circumstances a lockable override cover is available as an optional extra to maximise security. Multi-shutter electric installations can be wired to operate from a central or group switches. Ask for further details. Care should be taken to ensure that such installations are in line with current Health and Safety Legislation. The slimline profile of the extruded aluminium slat is double walled giving exceptional strength yet tight coiling for a small shutter box. Description: Seceuroshield 38 is a double skin extruded aluminium non-vented slat. Common use: High security domestic, commercial and office applications. Weight: 8kg per square metre. Stock colours: White, brown, black or cream. Construction: Roll formed aluminium in two sections; top and bottom boxes. Lower section of the 2 part hood box is removable for installation and maintenance and chamfered at 45 degrees for softer visual appearance. Box ends: The shutterbox is assembled on die cast aluminium endplates. 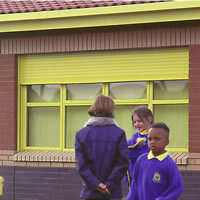 The 3800 security shutters can be powder coated to alternative standard RAL or BS colours at extra cost and, should this be required, we would be pleased to prepare a quotation. For higher levels of security the H40/S guide rail offers an increased specification to the standard guide rail and incorporates wind locks. These guide rails are available at extra cost to the standard guide rails. Dimensions: 60mm wide x 24mm deep. 3 fixings for guide rails up to 1000mm in length, 5 fixings for guide rails up to 2000mm in length and so on. Standard Samson security shutters lock automatically at the top when fully lowered. The bottom section of the shutterbox is riveted after installation. The fixing screwheads are rendered unusable and are concealed behind cover caps. Optional 30 x 20 angle can be fixed on to the cill. The options priced are shown on your quotation which also shows the method of operation we have included. This list shows possible options which would incur different costs. The swivel winder coils the belt when it is pulled to open the shutter. The belt is 14mm wide and grey in colour. 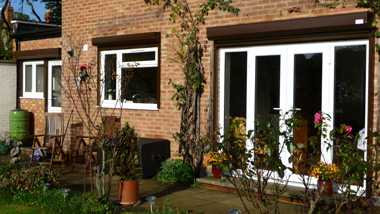 External shutters are supplied with a guide tube to protect the belt through the building wall. 1:3 ratio with removable handle for belt operated shutters. Incorporates a geared rod crank handle 1500mm long which hangs vertically and secures into a clip when not in use. The gear is installed in the box, the gear ratio varies with shutter weight. A counterbalance spring in the axle ensures controlled raising and lowering. An espagnolette keylock or shootbolts lock into the guide rails and are usually incorporated in the bottom slat. Final adjustment of the springloading after installation is always required. Electric operation is required on larger shutters due to the weight but is optional on smaller shutters. Draw 240 volts and 0.5 - 2.5 amps dependant upon the shutter size. Complete with integral limit switches and thermal cut-out to prevent overheating. Complete with 2 metres of cable for connection. Provision of a 13 amp fused spur is required for installation. A manual override should be priced and ordered separately for shutters which are to be installed on exit doorways to permit operation in the event of a power failure. 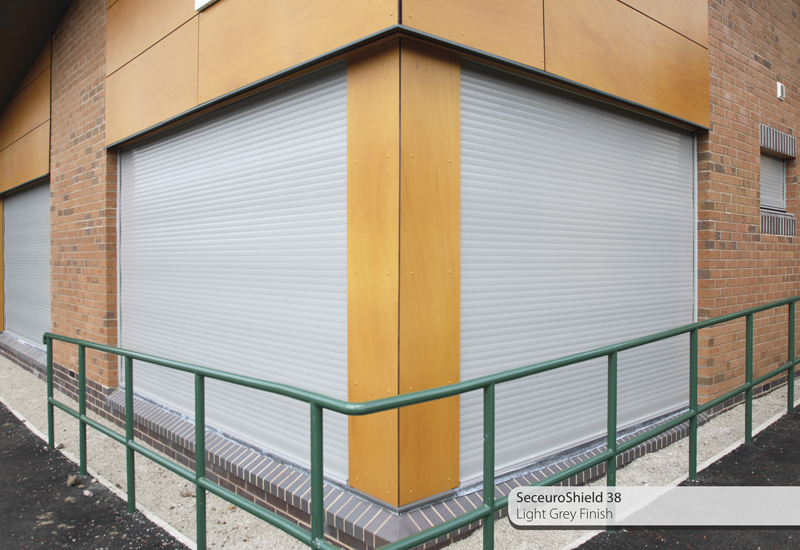 The Seceuroshield 38 is our most popular selling security shutter for its bix size, strength of slat and diversity in specification and colour. It is an ideal shutter for the majority of medium sized door or window security applications.